On my way to Bandung, West Java, via toll Cipularang, I stopped for a very striking scenery. 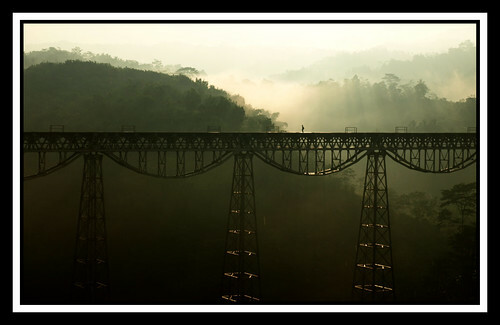 It was around 6-7 AM, sunrise strikes through a line of hills, a ray of light (ROL) and a railroad bridge as a foreground, sets the scene. The final shot was completed when a man or woman coming from a distance, walk-in the frame, creating perfect siluet and very good dimensional element to show scale.